We have an innate basic need for human beings to connect with nature and the term used to describe this is ‘Biophillia’. Whilst our working environments cannot quite replicate wild landscapes, we can replicate nature by bringing our beloved plants and trees inside. One way of bringing nature closer to our place of work is to create a living wall which can turn a plain bland wall into a living garden. What is a living wall? 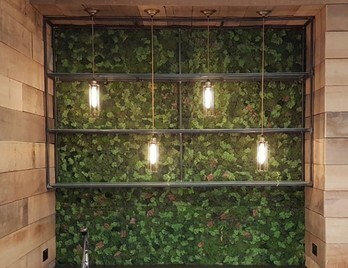 A living wall is a stack of planters, housing real plants, which fix to an interior or exterior wall, with it's own vertical irrigation system. 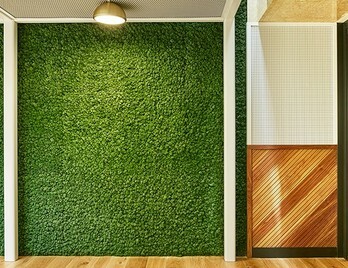 Living walls, however, can be costly to install and maintain so a suitable alternative is to use moss wall. The moss featured below is sustainably harvested in Scandinavia which is then cleaned and preserved. It retains its natural organic characteristics and is soft to touch. The moss naturally is anti-static which means dust is repelled from moss walls. The material is a much more practical alternative to living walls, both in terms of installation and maintenance. Moss is authentic, practical, affordable and fun. An added benefit of moss walls us that the moss has a softening acoustic impact on spaces where it is installed. Reindeer moss is found in great abundance in Artic lands. It has many small delicate branched and covers immense areas serving as a pasture for reindeer. Our selection of this type of moss is available in natural colours, with a few fun ones thrown in too. This type of moss is perfect for creating a luxurious, yet simple and contemporary looking moss wall. The panels are made by hand in the UK in a small dedicated workshop and can be made bespoke to your design. Moss is found in great abundance in Artic lands. Forest Floor replicates some of the terrain you may find on a forest trek or hike such as logs, bark, Helichrysum and Phalaris. This type of moss is perfect for creating a luxurious, yet simple and contemporary looking moss wall. The panels are made by hand in the UK in a small dedicated workshop and can be made bespoke to your design. The application of moss does not stop at wall panels either. It’s such a versatile material it can be used to create logo’s, lettering, shapes, and signage. Imagine your company’s logo made up from moss and the message it would give to your colleagues and visitors. An eco-friendly company or ones with strong eco credentials would certainly benefit from this type of treatment, bringing the brand to life. The Nature Moss Reindeer range comes in some fun colour variations too, so if you wanted to add a splash of colour or have a supporting colour range that fits branding guidelines, it could be a suitable solutions. Incorporating moss or moss logos can create a softer touch on the interior simply by choosing an organic material over a standard one. This, in turn, can be helpful if you also want to create a breakout area, canteen or yoga studio where people can relax, unwind and feel calm. Lightboxes, led lights or faux neon lights can be featured across a moss wall to really brighten things up. We can utilise all moss material, creating lettering using metal frames to your choice of RAL, coloured acrylic, CNC MDF shapes, 3D Polystyrene or even faux neon. 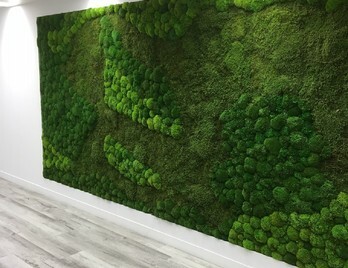 If you like the idea of incorporating moss into your workplace please do not hesitate to call us on 01823 663880.